The Group Manager is intended to be used for the purposes of classifying, organizing, and grouping users how you see fit. These can be user departments, job titles, facilities/buildings, roles, committees, etc. The more groups defined, the better you will be able to target groups of individuals with selected training. Having clicked on the gear icon to edit a particular group, you will be presented with a dialog similar to the above. 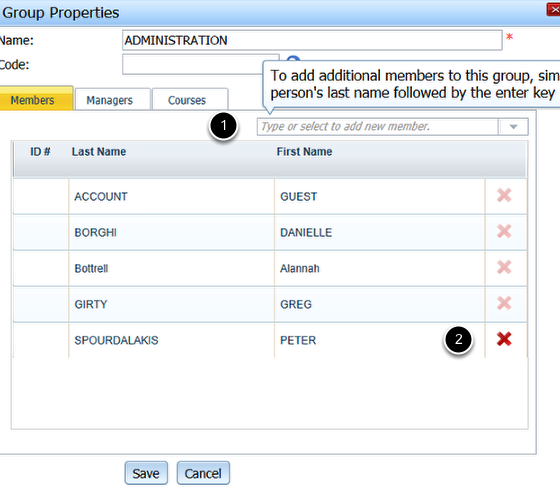 Within, you have the option of changing the name of the group, the group code if applicable, along with adding or subtracting members from the group. 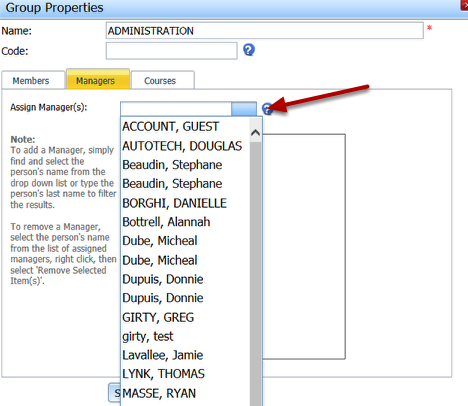 To add users to the group, simply type in their name or find their name from the drop down list (#1). To remove members from the group, simply click on the red X icon (#2) from the list of current members. In addition to yourself, you may assign one or more users to manage this group of individuals. 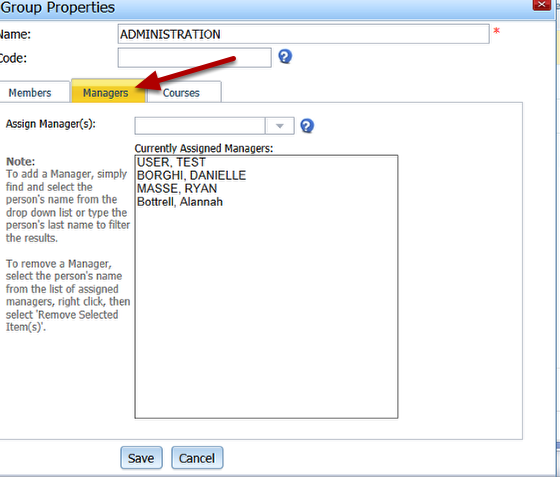 By assigning management privileges, this person will have the same level of permissions to the members contained as you would. In order to add an additional manager to this group, you simply click the drop down or type in this person name to find the person of interest. Once added click Save to commit your changes. 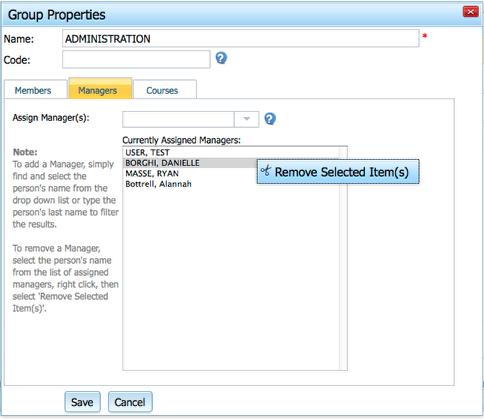 To remove a Manager from a group, simply find their name from the list of "Currently Assigned Managers", right click, and click on Remove Selected Item(s). Once removed click Save to commit your changes. Within a Group, you may assign any number of courses to be taken either as a requirement, or those courses deemed optional and that will be made available as an elective. Any elective course assigned, will be published and made available through the Registrar for users to freely sign up for at their discretion. Each course tab whether Required or Elective will contain a list of all e-learning courses assigned to the members of this group if any. 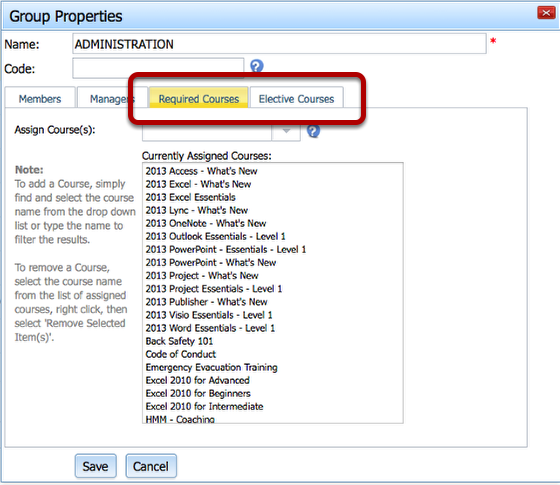 By assigning or removing a course from the group, you will effect which e-learning course(s) are required to be taken by the members of this group. 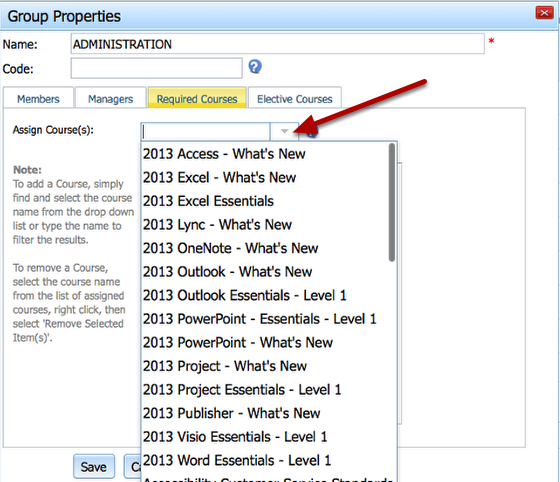 To add one or more courses to the group, simply click the drop down or type in the name of the course. Once added, click Save to commit your changes. By adding a course to this group, you are making this course mandatory or optional, depending on the tab, for all members of this group. 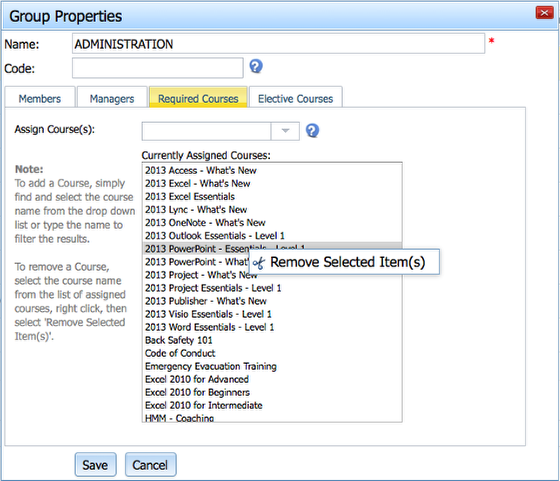 To remove a Course from a group, simply find the course name from the list of "Currently assigned to this group", right click, and click on Remove Selected Item(s). Once removed, click Save to commit your changes. By removing a course from this group, you are indicating that this course is no longer available for the members of this group to take.